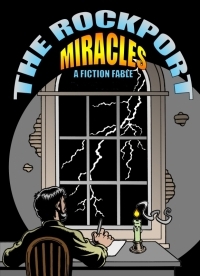 The Rockport Miracles-Part 3 Episode 2 "The Belles Of St. Swithun's"
Lester Brown was still hugging his Hasselblad when I flew out of his camera store like a squirrel torn between two sows. I couldn’t decide whether to run southeast to see Father Marlowe (and hopefully, Wren Mathews) or southwest to make sure my Mom got through the storm in one piece. In the end, Mom won the toss, again. During that moment of indecision I’d inadvertently looked north down 150th street and was stunned by a strange, if not, scarifying sight. Where there was once a long avenue coated with trees and houses, there was now an impassable road obstructed by large piles of sticks and stones. With nothing left standing to obstruct its view, I glimpsed something not seen from that mid-town vantage point since the earliest days of Rockport. I could see frozen Lake Erie. Trying to run the eight blocks to my street was like one of those dreams where it feels that one is running through quicksand. I had to stop at least a half dozen times along the way to help people catch their freaked out dogs, or move large branches from their yards. At one point, I helped a group of men free a young mother and child trapped after a live electric pole had fallen onto their 1960 Rambler American. The chunky Rambler was unhurt, (Patton probably used Ramblers during his campaign through the Ardennes), but hot wires were preventing their escape until some brave old retiree used his penknife to carve a forked end onto his wooden cane and then used it to snag wires away from the car. Finally, I reached my street and was relieved to see that the storm had delivered another glancing blow, just as the previous storm had on the night before. There were a couple old oaks that fell and plenty of downed tree branches, but nothing on the scale of destruction that happened in mid-town. Apparently, both storms had followed the same trajectory right up the crotch of Rockport, leaving its eastern and western flanks fully intact. It was epic weirdness that most residents didn’t appreciate until weeks later when the international meteorological community began showing up. My mom was thrilled to see me walk through the front door but was otherwise upset that she couldn’t watch her soap operas because the electricity was out. Famished, I retreated to the breakfast nook and inhaled the remaining half box of Cheerios after which I felt re-energized and ready for bear. I announced that I was going back out again and left the house with my mother yelling and holding on to the back pockets of my bell bottom jeans. Once I’d shaken her loose, I yelped out the obligatory “Don’t worry, Mom-Love You!” and then ran the entire mile to St. Swithun’s Church. St. Swithun is a Catholic church that also included a school and a princely abode where Father Marlowe and his assistant priests lived. I’d spent eight long years at St. Swithun grade school where my classmates and I were routinely humiliated and beaten by nuns. We called them “The Fighting Nuns” because of their tendencies to punch, slap, and finger schmoosh faces of the various sized children and adults they targeted. Ironically, Father Marlowe had always been a stellar pastor who would never abuse a child or tolerate abuse from any of his priests. A graduate of the Spencer Tracy school of priesthood, Father Marlowe was not shy to throw a punch at any priest, deacon, or drunken janitor that crossed him. That was well known and, in the Catholic way, respected. For some reason, however, he never interfered with the celibate women in black who ran the school. I suspect that he was as deathly afraid of them as our parents were. Had he anticipated the long term effects of their cruelty, perhaps he would have done something. Over the decades, children who had been schooled by the Fighting Nuns of St. Swithun grew up and would rather go to hell than expose their own children to that group of impoverished mental cases unhappily “married” to Jesus. By 1970, the school’s student population was in sharp decline and with it, the financial and spiritual viability of St. Swithun’s Church. Compounding the school’s decline was the fact that fewer women were becoming nuns. Instead they were choosing more conventional career paths including real marriage, ostensibly so that they could beat up their own children. Suffice to say, the future of the parish was hanging in the balance while rumors flew that the arrival of Father St. Charles, the young and snidely martinet, was intended to bring stability to the profit margins of St. Swithun and eventually replace Father Marlowe as pastor. By the time I’d reached the priest residence at St. Swithun, my blood was up and I would’ve cold cocked any nun that dared to get in my way. I was about to ring the doorbell when Father Marlowe himself came hurriedly out the door wearing his black hat and struggling to get his arms into his black overcoat. “I can’t talk right now, young man, I’ve been called downtown to see the Bishop.” His sudden appearance on the porch startled me. I sank back to my old timid self and started stuttering, “…Fa…Fa..Father..” I could tell he was in an impatient and excited state, so I jumped behind him to assist with his overcoat. “Father,” I said, “I’m looking for Wren Mathews!” A burping sound behind us signaled the unwelcome presence of Father St. Charles. His appearance at the door was accompanied by the sound of a loud vacuum cleaner droning just inside house. I heard Father St. Charles yell at the housekeeper, “MRS. MATHEWS--STOP THE VACUUM CLEANER FOR A MOMENT PLEASE!” The housekeeper turned around and her face became visible from the doorway. To my utter shock, I recognized her instantly! It was Wren’s mom! And, unlike my last encounter, she was sober! © 2018 Scott MacGregor-EOI Media Press Inc.